Calgary, April 1, 2016 Home prices declined further in March as economic conditions weigh on Calgary’s housing market. Calgary’s benchmark price totaled $442,800 in March, a 0.49 per cent decline over February and 3.51 per cent lower than levels recorded last year. March home sales in Calgary totaled 1,588 units, 11 per cent below the same time last year and 28 per cent lower than long-term averages for the month. Calgary also saw housing supply gains in most price ranges. Inventory levels rose by seven per cent to 6,084 units in March. 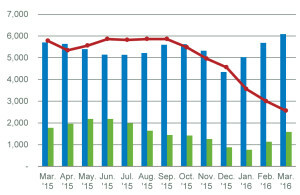 Overall, months of supply has averaged five months in the first quarter of 2016. The apartment sector has been the hardest hit by the recent downturn. After the first quarter of the year, apartment sales totaled 554 units, a 17 per cent decline over the same period last year. Apartment benchmark prices have been trending down since late 2014. In March, benchmark apartment prices totaled $281,300, seven per cent lower than levels recorded prior to the slide and 4.93 per cent lower than levels recorded last year.